1. In front of a lighthouse or if you have the possibility on the stairs or even on top! 2. Outside of a church, my go to place when I need shadow as there will always be a side with good light. 3. At the beach, obviously. 4. Inside a hip coffee shop, an awesome option for bad weather days. 5. In your garden, or the garden of someone else if it's fancier than yours. 6. At a museum, either in the exhibition hall or the pretty entrance hall. 7. In a city park. 8. At a train station for a more urban look. Make sure to get the rails on the picture but for God's sake don't step on them! 9. In a blooming alley. Time is over now but you can already look for suited places for next spring! 10. In a shopping street, a good option if you want to have some people in the background. 11. Besides a monument. And no, it doesn't always have to be the Eiffel Tower. 12. 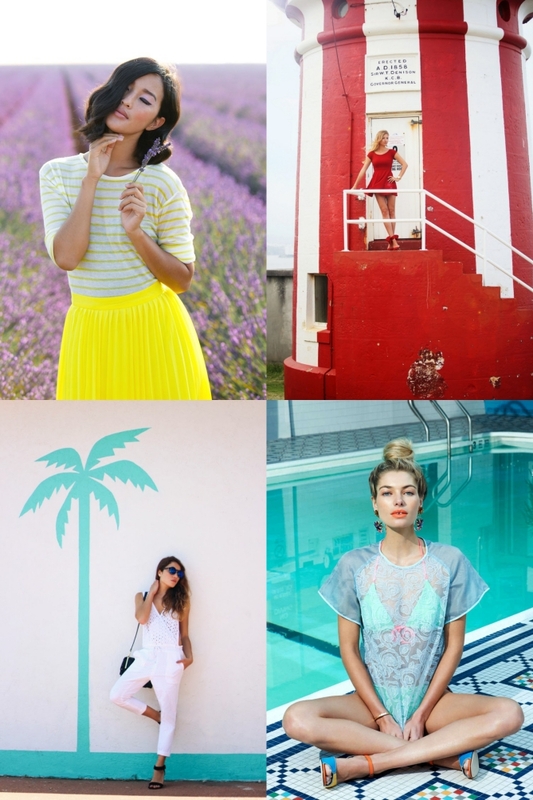 In front of a coloured wall that matches or contrasts your outfit. Or a wall with graffiti for the urban look. 13. On the stairs of a house or building (both inside and outside). 14. In front of the townhall, mostly the prettiest building in town. 15. On a factory site to contrast a girly look or to complement an androgynous look. 16. In front of a brick house. Belgium here I come! 17. In the room or reception of an elegant hotel. 18. Besides an expensive car - or a (yellow) taxi. 19. My favourite: At a swimming pool! 20. In a forest (if you like it green). 21. On a carousel or any other place of a funfair. 24. On a tennis court, you wouldn't believe how many magazines did this before. 25. In the entryway of a house. Pretty doors for the win! 26. In front of your garage. 27. At a car repair shop (which may either look Rihanna-Shut-Up-And-Drive-cool or calendar-girl-cheap...). 28. In a field of flowers (ideally lavender). 30. In front of an ice cream van or parlour for a pastel explosion. 31. In a shopping mall (for example on the escalators). 32. In the yard of a castle. 33. At an old cinema, either outside to catch the movie banners, in the entrance area for some popcorn fun, or in the cinema hall for a deep red background. 34. On the balcony of a hotel (or of your house if you have a nice view). 35. Inside or outside a circus tent. 37. In an empty room of your house. Pretty wallpaper for the win! 38. In a clothing store. 39. In the living room of your friend's awesome house. 40. On the rooftop of a building. 41. In a car park. 42. On a festival ground for major boho vibes. 45. In front of a flower shop. 46. On a market (food, flowers, antiquities - whatever matches your look). 47. On a farm or willow. 49. Any building that has pretty pillars. 50. And the classic: Just anywhere in the city. 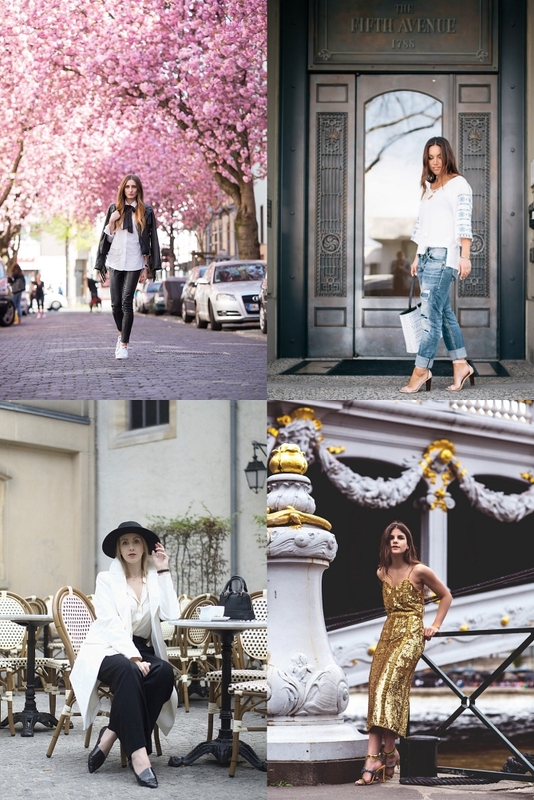 Can you think of more locations or where do you usually shoot your outfit pictures? Let me know in the comments or tweet to @Carmen_CandC. If we get enough suggestions I could make a second part to this post!